BlogConnections is a section wherein it shows some topic from other blogs I am following or news from bloggers I have known and I look up to. I am now posting about YugaTech's contest this Christmas season. 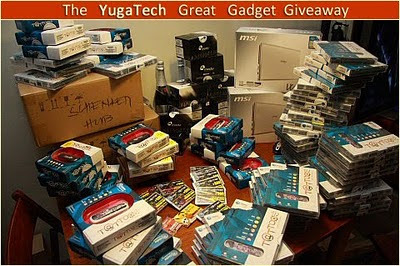 It's called "The YugaTech Great Gadget Giveaway" contests. Abe's going to give a number of gadgets to avid followers of his blog. Starting this week, Yugatech will be doing a series of different contests for our “YugaTech Great Gadget Giveaway” with a major theme around it. It will be really simple and have easy mechanics. Our contest for this week is called “Merry Tweetmas”. 1. Follow Follow @abeolandres and @talk2globe on Twitter. For more details, you can click on the photo above to go to YugaTech's page.